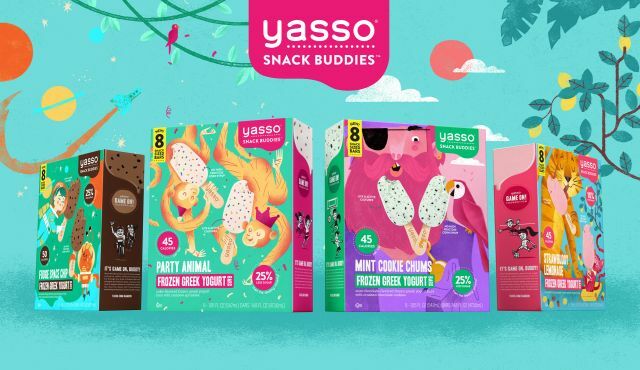 Yasso Frozen Greek Yogurt launches new Snack Buddies Frozen Greek Yogurt Bars aimed at kids. - Mint Cookie Chums: Mint chocolate-flavored frozen Greek yogurt with chocolate cookie pieces. - Strawbuddy Lemonade: Strawberry lemonade Greek yogurt. - Fudge Space Chip: Fudge chocolate frozen Greek yogurt with chocolate chips. - Party Animal: Cake-flavored frozen Greek yogurt with rainbow sprinkles. According to the brand, Snack Buddies include 25 percent less sugar and 10 percent more protein than the leading frozen novelty. Like Yasso's original line, Snack Buddies contains live and active cultures and no high fructose corn syrup. The new line comes eight bars to a box and can be found at select retailers nationwide.